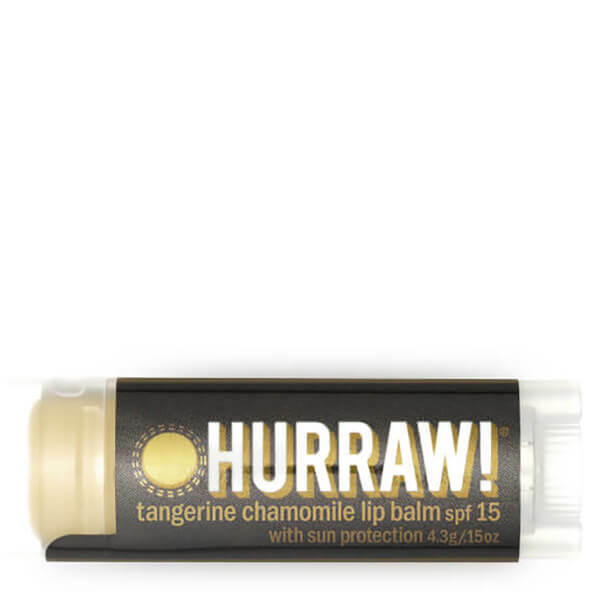 Shield lips from damaging rays with the Hurraw! Tangerine Chamomile Lip Balm SPF 15; an ultra-hydrating formula that cares for skin using premium organic, vegan and raw ingredients. Enriched with SPF15, the creamy balm blocks UVA and UVB rays to give lips the extra protection they need during periods of prolonged sun exposure. The twist-up stick effortlessly glides over lips, enveloping skin in the extra-thick formula, which boasts long-lasting results. Formulated with a skin-loving blend of Red Raspberry Seed Oil, Sea Buckthorn Oil and Pomegranate Seed Oil, the rich lip balm provides superior nourishment, hydration and protection. Not only preventing sun damage, the formula is also the perfect companion when soothing and healing already damaged lips. Expect a healthy and hydrated pout. You really only need one or two swipes of Sun balm for protection, many swipes will indeed give your lips a white tint. Be sure to apply it often for protection and to keep that physical zinc barrier alive and well. Please Note: Due to the herbal extracts and zinc (mineral) constitutions we use in the Sun Balm, variations in color may occur and is normal.